Professor of Literature Cynthia G. Wolff filed a lawsuit against MIT on April 7, charging that the Institute breached its obligations as an employer by allowing a "hostile work environment" to continue. The official complaint states that Wolff is suing because of "the Institute's wrongful acquiescence in and perpetuation of a persistent and continuing pattern of professional, political, and sexual harassment towards [her] in the workplace." When contacted yesterday, Wolff would not comment on the case. Her lawyer could not be reached. The suit mentions a few incidents in which Wolff claims other members of the literature faculty have retaliated against her for her opposition to granting certain junior faculty tenure. One incident allegedly took place in 1981, when Wolff voted to deny tenure to Ruth Perry, who has since been granted tenure and is currently head of the Women's Studies Program. In the suit, Wolff alleges that Perry is now excluding her from the Women's Studies Program. The suit also alleges that when Wolff voted to deny tenure to another junior faculty member in 1988, she and another female professor were verbally abused by some of their colleagues in the Literature Section, including professors David Thorburn and Stephen J. Tapscott. Wolff claims that the administration failed to act when she reported these incidents. Wolff spoke to then-Provost John M. Deutch '61 about problems with several personnel cases. She alleges that the cases "were not being judged on professional criteria," that section meetings were unprofessional, and that Professor Theoharis C. Theoharis had told her he was being sexually harassed by Professor David M. Halperin. According to Wolff, Deutch said nothing could be done. 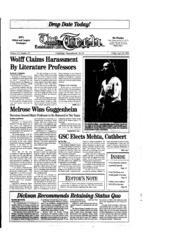 Wolff approached the current provost, Mark S. Wrighton, in 1991. He created the Clay Committee "to review the tenure process and the Literature Section generally," the suit states. The suit also claims the Clay Committee found that Theoharis' tenure process and rights had been interfered with. In September 1991, Wrighton acted on this finding and suspended the literature section's personnel selection powers. Wolff said Wrighton "laid the foundation for further retaliatory action" when he later identified her as the informant whose actions led to the formation of the Clay Committee. The suit contends that MIT did not prevent retaliation against Wolff during the peer review process, did not take action against faculty who conducted themselves improperly, and knowingly allowed harassment to interfere with Wolff's work. Wolff is seeking damages "in an amount likely to exceed at least $50,000," according to the civil action document. Perry denied that Wolff had been excluded from the Women's Studies Program, saying that "Wolff has never submitted a course proposal to Women's Studies." Isabelle de Courtivron, head of the foreign languages and literatures section, said she does not remember getting a proposal from Wolff while she was head of the Women's Studies Program from late 1987 to early 1989. According to Perry and De Courtivron, course proposals are judged by the Women's Studies Program Curriculum Committee, not by the head of the program. "I've never sat on the curriculum committee," Perry said. "One of the things that disturbs me is the way I'm being pin-pointed." Perry said, "I would like to clarify factual mistakes, but I don't want to comment on anyone's motivation." She also said she has never witnessed any incidents of harassment against Wolff. Halperin said there have been occasions when Wolff's views were defeated at a section meeting, but that this does not constitute harassment. "If all of us sued every time we lost a suit against our colleagues, there would be endless litigation," he said. "I think [Wolff has] had quite a lot of power within the literature faculty," Perry said. "She's consulted on all decisions." Halperin agreed: "The notion that she's been excluded is preposterous -- her opinion carries great weight." Both Perry and Halperin said Wolff is the highest paid member of the literature faculty. Wrighton said he is not in a position to comment on the lawsuit, and that MIT will respond through its legal counsel. Thorburn expressed dismay at the suit. "My understanding is that the Institute finds no merit in the suit and plans a vigorous defense in court. This is appropriate in my opinion because Professor Wolff's claims are entirely false. Her characterization of me is particularly distressing, because I've devoted so much of my time as a teacher and writer to a pluralistic and dialogic idea of intellectual work," he said. Tapscott said, "[The suit] saddens me. The specific charges are inaccurate, ungenerous, and unfair, but more to the point, it saddens me that these kind of charges distract attention from important things going on between professors and students." Wrighton said that when he became aware of problems in the literature section, he appointed the Clay Committee to review the situation. Wrighton also said he and Associate Provost Samuel J. Keyser worked with Peter S. Donaldson, head of the literature faculty, "on a process to rebuild relations." Wrighton said the Clay Committee's report led him to conclude that "improvements were necessary." Wrighton said appointments and selections in the Literature Section are presently handled by Donaldson, Dean of the School of Humanities and Social Sciences Philip S. Khoury, and Wrighton. This is "somewhat unusual," he added. Normally, these decisions are made in the sections themselves. "I am very concerned about issues such as feelings that people have not been able to work in an atmosphere conducive to their scholarly research. Differences among people are not easy to resolve," Wrighton said. Wrighton said he is pleased with the outstanding things being done in the literature section, and that all these good things continue despite the faculty problems. Donaldson said, "The group has made a strong commitment working out its problems internally, and that process is going well. There were a series of problems which led to a process of recovery. Most people are committed to that process. Obviously it's my wish that problems be resolved in a collegial spirit." Perry said, "My own feeling is people in the literature faculty have tried to talk to each other about our intellectual differences in the last five months or so. We've made progress. I think the process has been a healthy and a good one -- that's why this has been quite a shock."